Innovative inset fingers slope inward toward the back of the manager offering unobstructed access to network cabling. 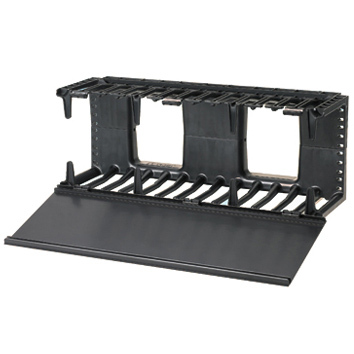 Large front finger openings easily accommodate Category 6 and 10 GbE cables. Rear cable management finger spacing utilizes open D-rings for greater accessibility. Can be used to create large capacity horizontal pathways for routing cable. Patented front and rear dual hinged cover allows cable access without removing cover. 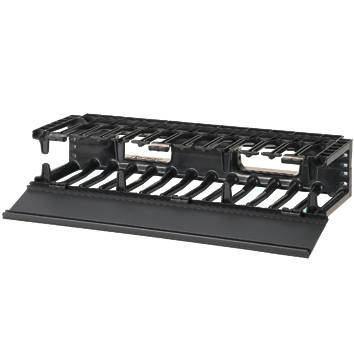 Built in cable retainers hold cable in place for easy moves, adds, and changes.